If you have a new MacBook Air or MacBook Pro and the colors seem a bit dull and washed out compared to your previous Mac, you probably aren’t imagining things. Like most other hardware companies, Apple sources display panels from a variety of screen manufacturers, and though all the displays are of very high quality some show colors and contrasts a bit different than others. If your black levels seem more grey and colors aren’t really popping out, you just need to calibrate your display to resolve the dull color and low contrast issue, it’s easy to do and just takes a few minutes. Before beginning, you may want to check the manufacturer of your display panel. Typically the Samsung displays don’t need calibration, whereas the LG displays do. Specifically for MacBook Air owners with LG displays, check this post to grab a pre-calibrated profile too. The difference in color representation and contrast should be significant after display calibration, you can immediately check the difference by clicking between the default “Color LCD” and the newly created calibration profile. Black and white levels should be more accurate, contrasts should be better, and colors should be more vibrant and accurate. This isn’t a permanent change, and at any time you can recalibrate the display if you want to, and you can also return to the default color profile just by selecting “Color LCD” in the profile list. 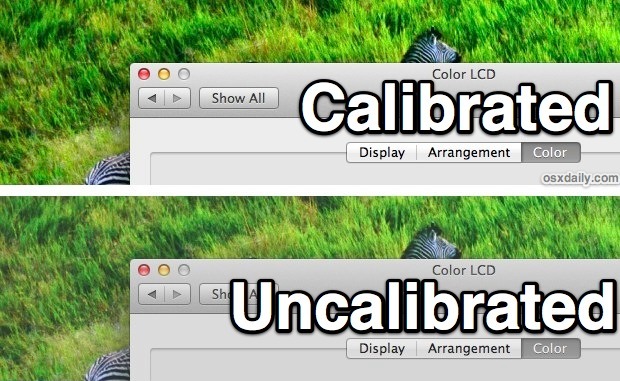 Topmost image is a simulated representation on the difference between a calibrated and uncalibrated display, because calibration effects how screens display colors it is impossible to capture in a screen shot. I hate the calibration tool, and just about any calibration method on any display. Maybe it’s just my eyes but I can never get the images in the steps to match what the directions say. “Move the left slider until the brightness of the grey shape in the middle matches the backgrounds as much as possible.” So you’re supposed to match a solid-grey colored apple logo to a background that is on top of a 1-pixel high stripe pattern? Who thought that pattern was a good idea? No matter what I set it on it’s no better than the default. The OS X calibration tool only succeeds in frustrating the hell out of me. I am pretty this problem is unique to you. I have been using such tools since windows 3.11 days, using a grey square not an apple. Never have I had any problem getting my screen calibrated. There’s a reason for that pattern, and it’s the only way to do it. Obviously you can’t use a color on a monitor as a reference to calibrate that monitor, since that color will be off in the first place, and it will change as you adjust the calibration of the monitor. You can however show black and white right next to each other in a repeating pattern, and make the assumption that a viewer will mostly see it as gray. The same goes for black to pure red, green, or blue. The middle tone there will look the same regardless of calibration or not, since it’s just the pixels (or subpixels in the case of R, G, or B) being fully on or off. Then you can match a solid software representation of those middle tones to it. If you are having trouble seeing a color in the pattern, try defocusing you vision or look at it through someone else’s glasses or without your own. The calibration tool actually works. As stated, it says you should try to “squint”. That helps for sure. I also tried my own method: I reduced the brightness down to its lowest level. Thanks to OSXDaily, use shift-option-brightness button. That will adjust it incrementally. Once on its lowest setting, go ahead and calibrate the display (also while squinting). Hope that helps. I calibrated my display both ways, with the brightness at maximum and at minimum. Both had pretty much the same result. Any comments on the method I tried? I’m assuming this is only for the Air and the regular Pro but, is this also the case with the MacBook Pro with Retina Display? Well, uncalibrated monitor screenshot is much better: colors are natural. “Calibrated” sample is way too oversaturated. Calibration purpose is to make the screen to display right colours, not to make colors to pop up. I think they have their before/after images backwards. has anyone else noticed the following with an LG display or found them less good than samsung? (I checked and my new macbook pro 15″ has an LG display) – thing is my colors are not as bright as my last macbook pro, nor as bright as the display models at the store I bought it at (we’ve gone through two now trying to find one that’s better) – side by side comparison with the mac guy and tech guy and we couldn’t match them up – all the calibration adjustments won’t do it – the white is not a true light-cool white – everything is a warm/yellow/ashy/dirty tint to it – i can’t get a white-white…anyone else notice this. It’s a bit easier on the eyes but making me crazy – it’s not that pure white (like on the iphone – the contrast of the word google against the white) – but a yellowy/dusty white (and yes, I know how to calibrate and tried it for hours on end. – not possible unless everything is made to tint a blue hue. I’m with Jay on this. Apple’s calibration directions truly do NOT make sense. It’s impossible to determine the brightness of the shape, let alone figure out what we’re to compare it to! Vs. the brightness of what? The backgrounds? Say, Apple, there is one background, not multiple ones! If they mean the white background, a grey shape won’t be that color. If they mean the stripes… what’s the difference between “brightness” and rendering the shape “neutral” as the rest of the directions says? They absolutely need to redo this or rewrite the directions! Just got done reading this article, not bad, I have a refurbished 13″ MBA Maxed out and the LG screen. Could not get the calibration working properly so called Apple care and was told that they do NOT support the calibration program built into the OS. After several apologies from the rep I said good night, every logical question I ask they can’t answer, the only suggestion was to trade the refurbished model for a brand new one and see if things work out better. I don’t know how to interpret what’s stated on the calibration tool screen. My goal is just to cut blue lights and ultimately reduce eye strain. Does anyone know how to achieve this purpose? I’m using Flux and feel it has helped. I’ve also used accessibility to enlarge the cursor size. Any way to cut down blue lights or make fonts darker or bolder will be helpful, too. I’m in my mid-40’s, and dry eyes and eye sore have creeped on me started last year. I need to work on the computer for long hours every day. Any advice/help will be appreciated. Yeah, the instruction “Move the left slider until the brightness of the grey shape in the middle matches the backgrounds as much as possible” is terrible wording. It ONLY makes sense if you see the background as a solid grey rather than black and white stripes, and even then pluralizing “backgrounds” is confusing. this is great advice. to get this working ended up taking off my glasses, sitting back, and squinting until the black and white lines looked solid grey. then followed instructions. eyes hurt a bit during but my display looks awesome now! For recent versions of macOS (since at least 10.11 El Capitan), one needs to option-click on the “Calibrate” button in order to get to the “Expert mode” with the adjustable sliders and the “Apple logo on striped background” comparisons.